According to recent research, Aussies, especially those aged 45 to 55, have led the boom in Phuket medical tourism with dental care one of the top three most popular treatment segments. Dental tourists and local expats agree it’s the combination of Phuket’s state-of-the-art specialist dental clinics as well as the major cost saving compared to Australia that tend to be the deciding factors. “I wouldn’t just go anywhere for dental work,” says Lucy Neal, aged 47. “Phuket has a really good reputation for medical tourism and my first priority was getting high-quality care, though the difference in price really helped make up my mind. I checked out costs in a lot of countries and it was off-putting how much more expensive it is in Australia. Lucy did her research online before arranging a consultation and found that the more established clinics have very detailed websites with their dentists’ qualifications and training clearly stated. They also featured extensive price lists for different treatments and testimonials with case studies from satisfied customers. Lucy went to Dental Care Clinic led by Phuket dentist Dr Panachai, who has been treating international patients for 32 years, alongside a highly-experienced team of specialists who have certifications and training from the U.S. and Europe. Aside from credentials, the clinic promotes dental tourism through packages that include free transfers and hotel rooms once you book over $1,850 in treatments, plus extra holiday bonuses when you spend over a certain amount. Patients who spend over $3,700 can benefit from up to 10 nights free accommodation at boutique hotels near to Phuket Town where studios and suites with poolside terraces cost from $90 to $130 a night during high season. 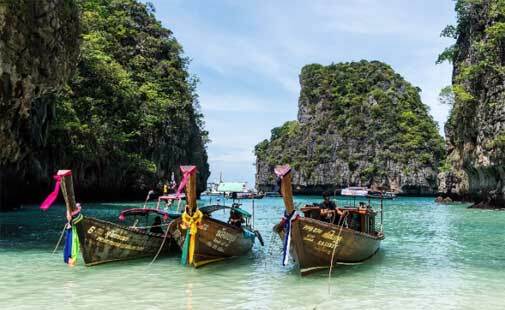 The choice of an all-expenses-paid trip to Coral Island or the Phi Phi Islands (pictured below) is another bonus. This includes a morning transfer from the hotel to Royal Phuket Marina where a speedboat whisks you away for some serious island-hopping adventure. Patients who spend over $10,000 can get up to 20 nights accommodation and even more tours to choose from including a trip to Maiton Island by catamaran or sea kayaking near James Bond Island in Phang Nga Bay. All-in-all, it makes for an attractive proposition to those interested in both the cost savings and coastal charms of Phuket. Sydney native Alan Hansen, aged 71, retired to Phuket on a permanent basis several years ago but had been attending the island’s dentists for the best part of 10 years before moving there. Alan realised he could return to Phuket regularly to get more extensive treatments which otherwise would have been too costly for his limited budget back in Australia. Alan has since had a lot of work completed at the Sea Smile Dental Clinic in Patong which is the first on the island to be JCI-accredited with an ISO:9001 certified in-house dental lab. He says that it’s important to select an established clinic where you feel comfortable and confident. He also thinks it’s better to pay a little more to get the best service as prices are so competitive already.